After completing his probably most known manga Tekkon Kinkreet not a few days ago, I’ve now become a fan of his. Not only because of his stunning and masterful drawings, but also because of his sensitivity as a storyteller. In Tekkon I saw a more captivating side to him, though it did take a volume and a half for the story to get that way. There’s the subtle emotional build-up between the two main characters Black and White that occurs in alternation between the ordinary Treasure Town cityscape and the various dreamscapes Matsumoto cooks up. Flashes of this were in Zero, but it all just came to a more well-realized head in Tekkon. There’s also the way he handled the characters adapting to the changes occurring in their immediate surroundings, like Kimura and The Rat. Personally, I found Kimura’s story the most affecting and developed among the entire cast. The manga was on the whole quite vague, but the other parts worked well enough to make it a very entertaining read. Moving on, Takemitsu is a very different beast from the earlier Matsumoto manga I’ve read, not only because of the obvious changes in the art, but also in the story behind it. This time, Matsumoto isn’t credited for writing the manga, but a fellow called Eifuku Issei is. I don’t know who that guy is, so I’m just going to leave that to the more learned people. Still, even with a different writer at the helm, Takemitsu still feels very much like that of the earlier series I knew the artist for. His powerful painterly drawings helped inject enough of his personality into the manga to call it his own. Without the art, I don’t think that the manga would have the same grand effect it had, no offense to the author. It’s just that Matsumoto interpreted the story in such a personal and stylish way that it almost becomes something else entirely. It’s also where Matsumoto‘s latest artistic inclination was highlighted, and revealed in full force. The way I’ve been talking about Matsumoto‘s art switch from the days of Tekkon to Takemitsu makes it seem like he just woke up one day and decided out of the blue, “Oh, I haven’t tried using brushes like this before, let’s do it here then”, but actually, it’s more gradual than that. After diving through what I had, I found that he’s began laying down the groundwork for this style in his one-shot contribution to the French-Japanese collaboration work Japan As Viewed by 17 Creators called Kankichi (also the name of one of the characters in Takemitsu, funnily enough). In the one-shot, the of use of brush and ink wasn’t that liberal and heavy yet, but you can see that his lines have become a little softer, and that his characters are now a bit more elastic. It seems that he’s been working on such a style way before Takemitsu, and that he took his time mastering it before showing it in Takemitsu a few years down the line. And what an effect it is. The artwork, though looking as slapdash as ever, now looks particularly more refined and well-worked. The lines are now the softest I’ve seen of a Matsumoto drawing, and the way he composes the frames look as elegant as they were before. I feel that there is also a considerable influence of the old Japanese ukiyo-e art, but I think that’s just me. His drawings are now stronger, more evocative, and more artistic than I’ve ever seen them. More than the simple and humorous story, I find that it’s the highly personalized art that makes Takemitsu the great manga that it is. Without it, the manga wouldn’t be half as good. And yes, Matsumoto also treated us to a smattering of beautifully done brush drawings that speak of a classy and painterly hand. I think those drawings are probably the best part of the whole affair. With only a few brush strokes, Matsumoto manages to insert just the necessary emotions needed in one particular scene. His masterful hand is present everywhere here. Not only does it evoke varied emotions from the reader, I find that Matsumoto’s drawings also helped round out some of the characters in the manga and helped flesh out their personalities. The two characters Senou and Kikuchi are probably the best examples of this. Senou, the protagonist of the manga, is depicted as an air-headed, easygoing samurai with a hidden side to him, and that’s best exemplified in the action sections. He transforms into a wild, beastlike form that really reinforces the notion that he does have a hidden killer side to him, and that effect is achieved through the undulating and elastic way he is drawn. It’s the same effect as with the character Kikuchi. Numerous times in the manga the man was depicted as an insane, murderous killer, and the way Matsumoto draws him only strengthens that idea. In the various fight scenes the man is in, he is drawn in a rough, crazy, almost animalistic way thanks to Matsumoto’s adept manipulation of the ink brush. The drawings look crude and unpolished, but they achieve more of the effects desired by the story much better than normal pretty drawings for a manga. Don’t be fooled; Matsumoto is definitely not an amateurish artist. Hidden beneath the unruly exterior of the art is the assured hand of a superbly versatile guy. The actual story of the manga itself is quite interesting. It’s not the ordinary action samurai manga, in the sense that its tone is more easygoing and lighthearted, almost lyrical even. Takemitsu feels more like a “slice-of-life” manga (for lack of a better term), just infused with the trappings of a samurai fighting story. It follows Senou Soichiro‘s life in Edo as a ronin, and his eventual discovery of his past–quite similar in fashion to Kenshin, only more grounded and subtle. Such is the nature of the manga that it doesn’t have a lot of tense moments and scenes which scream a sense of immediacy and urgency, save for the times it needs them. There’s enough intrigue layered in the calmness of the manga to keep people on their toes, and I guess that’s just fine. Of course, Takemitsu Zamurai being a samurai manga, it wouldn’t be complete without the required fight scenes. Again, this is where Matsumoto‘s art shines through. They’re paced quite well, and they’re just beautiful to look at. I haven’t seen action scenes done in such majestic, beautiful combinations of well-drawn poses and seemingly random, pulsating images yet. The closest I can remember getting to that would be in Samura’s early Blade, where he uses elegantly styled “death murals” to highlight a kill scene. Still, I almost couldn’t follow most of what was going on in Takemitsu, but since the drawings by themselves are wonderful to behold I found myself staring at them regardless. The brush work highlights the line art very well, achieving the effect of evoking tension and admiration at the same time. Taiyou Matsumoto puts in some of his quirks into the art as well. He makes random stray animals talk to each other on the street, and at times he even makes them talk to the humans as well. I found that very fun and charming. It’s like he gives the manga another dash of humor without being too overbearing or in-your-face about it. At times there’s also some layered conversations between some of the recurring animals (namely the black dog and the black cat) that give the manga another edge to it. These random bits of dialog also act as good transitions to the dialog between the characters themselves, or as a bridge for their scenes to play out. Takemitsu is quite the subtle affair. There are moments of characterization that are hidden below the dialog, but are effective, such as Senou’s relationship with Katsu. The manga makes them affecting without being too obvious. It’s like instinct. You know what they mean without them stating it outright. That’s another part of the manga I liked. 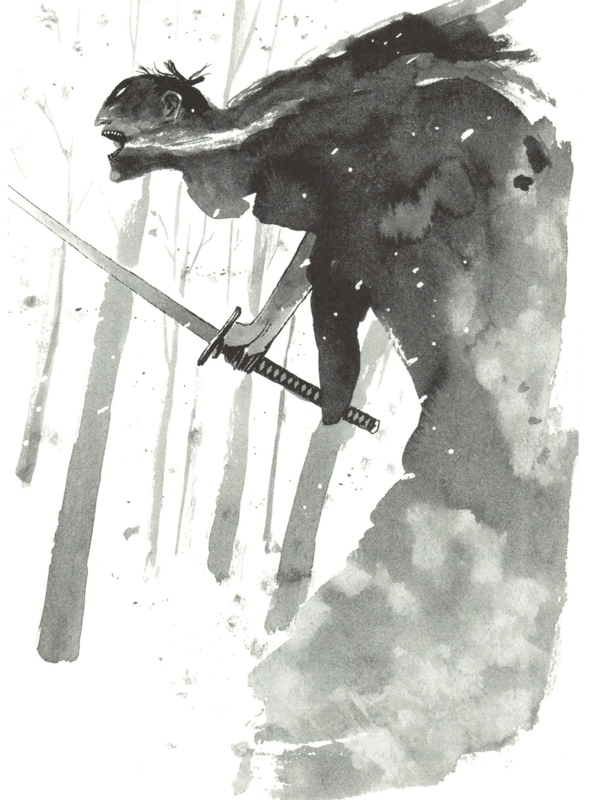 If I was asked which of Taiyou Matsumoto’s works I would like to see animated next, I would pick Takemitsu Zamurai. Mostly because I would like to see how his new artistic choice would translate into animation. It’s most likely going to be a very difficult and painstaking task, but if it’s done well, I think it would be pretty incredible. Seeing those brush strokes being ported off into a moving medium would be fun. Some animators could pull it off, I think, and the final product, if done well, could be another great example of anime on its most basic, which is relying more on liberal applications of personalized style and artistic insanity rather than pure detail of motion. Matsumoto has a new serial going currently on Shogakukan’s Big Comic Spirits, and I’m curious as to how it looks. Some tell me it’s more of a hybrid between his past manga and Takemitsu.